I love salads. I could subsist on them, easily, for the rest of my life. They’re just so versatile, and healthy, and yummy too. Even my kids love salads, which is awesome to me, seriously. I know, growing up, that I wanted nothing to do with lettuce and other veggies, fruits, nuts, herbs, you name it, I didn’t like it. But one day my tastes changed, and I opened up to this whole wide, wonderful world of salads. Delicious. 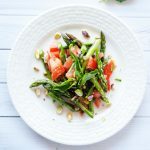 What I love best about this tomato and asparagus salad is that it features such a variety of tastes and textures, while utilizing the best of the season’s flavors and fresh ingredients. 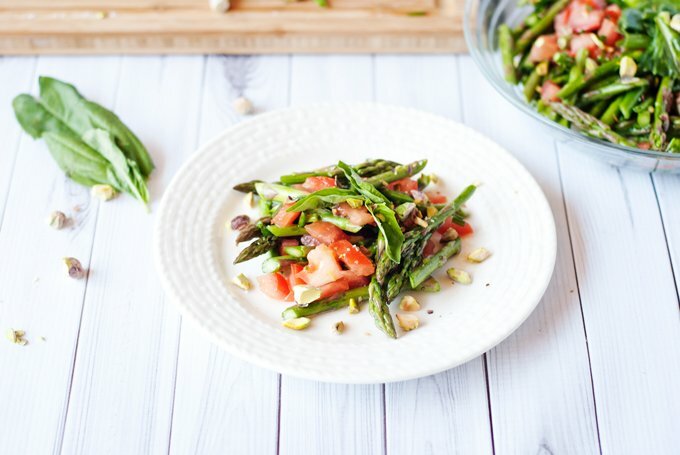 One of my biggest tips when it comes to this salad is to only use the thinnest asparagus you can find. The flavor is so much better than larger stalks of asparagus, which can be woody and tough. Some people really prefer that flavor, like my husband, but not me, no way. Pencil-thin is best. Occasionally, I like to blanch my asparagus, which means I drop them into boiling water for about 3 minutes and then immediately place them into ice water for 3 minutes. This process makes them just a little bit tender, which I enjoy, but is not necessary for this salad. Either way, it’s delicious. 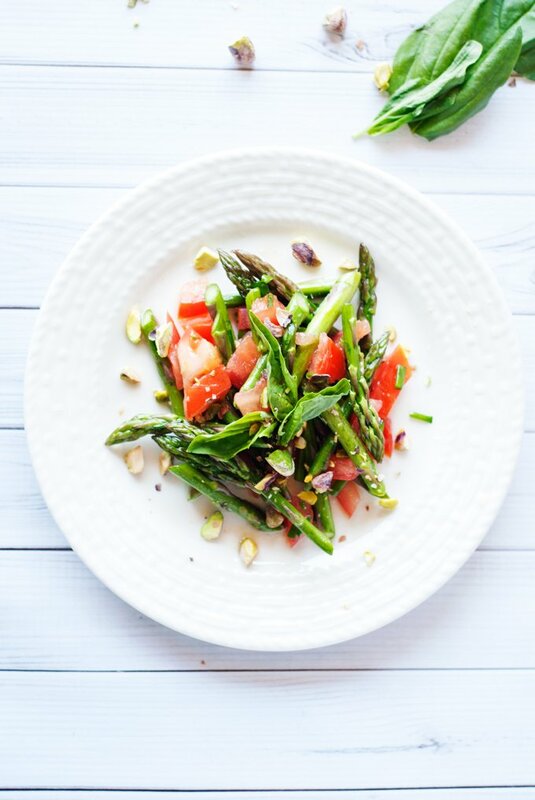 Give this tomato and asparagus salad a try sometime, I promise you won’t be disappointed! Seed the tomato, then finely dice. Wash the chives, dry thoroughly, then slice thinly. In a medium bowl, mix the honey, apple cider vinegar, salt and pepper. Add the two oils and beat thoroughly. Add the tomato and chives to the bowl and stir carefully to combine. 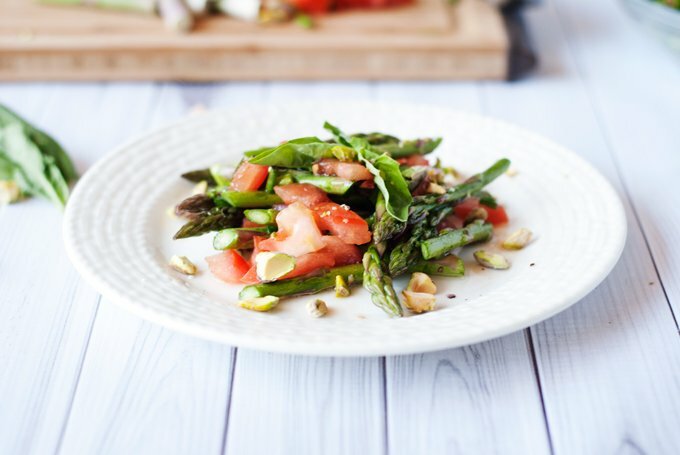 Cut the asparagus diagonally into thin slices and immediately add it to the tomato and dressing mixture. Arrange the salad on plates, then garnish with some fresh basil leaves and a sprinkling of chopped pistachio nuts. Serve immediately and enjoy. Oh, this sounds so tasty! I love all of the ingredients. Just stopped over from your feature at Something Fabulous Wednesday...when I saw your salad, I just had to come by and get your recipe! I am on a salad kick and I love everything in this! I just pinned it...can't wait to try it! Great minds think alike! I posted an asparagus salad today too. I am loving the tomatoes in your version. So colorful. Yum! How is it that I have never visited your site before? So glad to have found you! I am loving your images, and totally agree that I could live off of salad forever. Love X3 this salad. So yummy and fresh! So pretty! I'm so happy it's asparagus season! 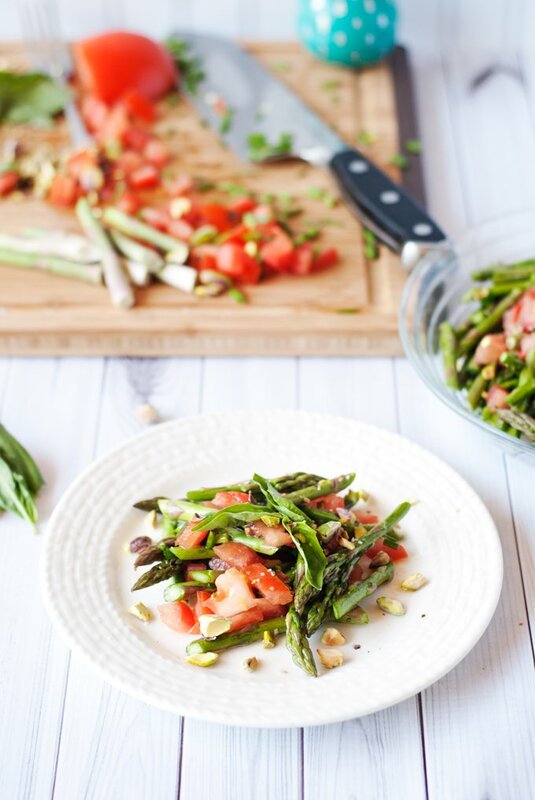 What a gorgeous salad Karly, we are asparagus lovers over here so this is happening at our house asap! Love all the different textures and flavors! This looks great Karly. 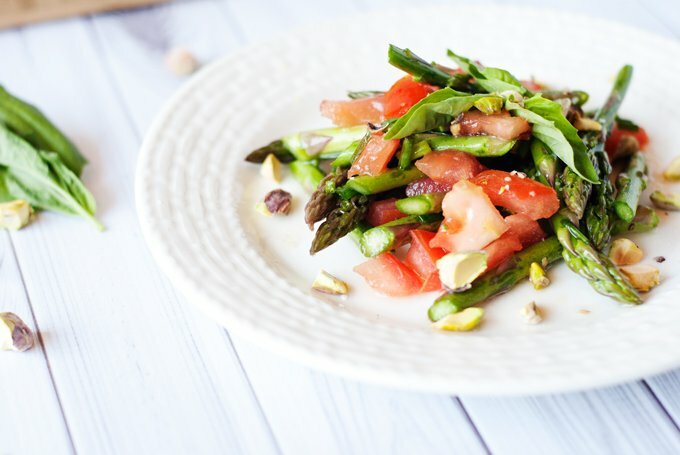 I have some tender baby asparagus right now that will be perfect in this salad! Wow - what a gorgeous salad! I love asparagus, so glad it's in season again!